Background: OLE Nepal’s laptop program was introduced in fifteen schools in Baitadi on September 2016, with the deployment of laptops and installation of digital library in the schools. All the teachers from the schools participated in a three-stage training program designed to develop their skills and confidence in using technology in classrooms. In addition, two teaching residents were assigned to support all 15 schools for a period of seven months on a rotation basis, to support students and teachers. In order to check the effectiveness of the program on student learning (specifically in math, science and English subjects), we had conducted two sets of surveys, with the baseline survey done in September 14 to 23, 2016 (before the introduction of digital resources and laptops at the schools), and the midline survey in September 2017 (after one year of program launch). Methodology: The baseline survey was conducted amongst students from grade two to four of all 15 program schools. A group of 15 students from each grade were randomly picked to take the survey in three subjects, and students were further subgrouped to five students for each subject. If there were less than 15 students in a class, all the students were equally divided into 3 groups. Students were allowed an hour to complete the survey questions that consisted of multiple choice questions. Students from younger grades were guided by the enumerator or the teachers. They read the questions to the students as they might have had problems in reading the instructions. They were also given examples on how to mark the answers of their choice from the set of multiple choice questions. The baseline survey was jointly administered by the respective school teachers and the OLE Nepal volunteers. Similarly, after one year, a midline survey with the same set of questions was conducted amongst students of the same grades. The midline survey was conducted by the respective school teachers and OLE Nepal’s teaching residents. In total, 450 students were surveyed from all 15 schools. Among them, around 52.89% were girls and 47.11% were boys. There was varied number of students according to the grade and subjects. So, while dividing equal number of students in each subjects, we have excluded or minimized extra number of students in analysis were randomly done on the basis of serial number (not relevant with obtained marks). For instance, if surveyor took the test of 13 students, then there is difference in number for different subjects at that time. In such cases, we have excluded one person from analysis to balance equal number (4 students) in each subjects. There were 15 to 45 students chosen from each school depending on the total number of students. Data analysis: All the tests papers were checked and scores were compiled for both the baseline and the midline surveys in excel sheets. These scores were then tabulated on excel, compared, and graphs were generated for easy comparisons. 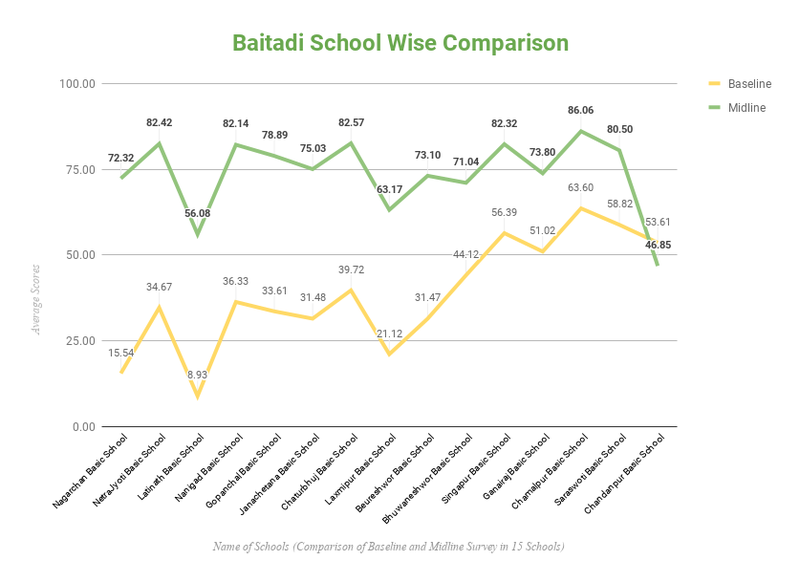 Average scores of Mathematics, English and Science in the baseline survey was 29.49, 37.91 and 48.69 respectively, in the midline survey, subject wise averaged 68.02, 76.65 and 76.59 respectively. The average score of baseline survey was around 30 to 50 % but the average score of midline survey was around 70 to 80%. The average score of Math and Science shows higher increment than the other subjects. It shows that laptop integrating teaching method has positive impact on student learning. We can see more increment in English and Math around 40 % from baseline to midline. Notably, all grades have shown improvements between the baseline to midline period. 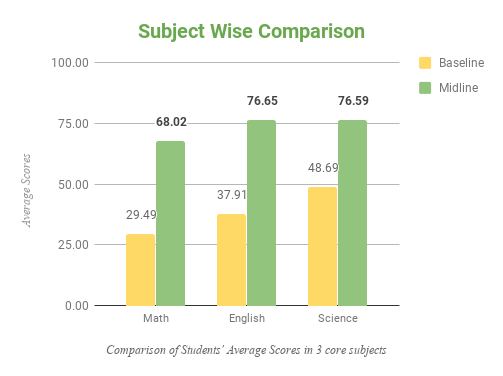 The figure 3 shows that the grade-wise average scores of all schools. The percentage of improvement is impressive in midline than the baseline score. 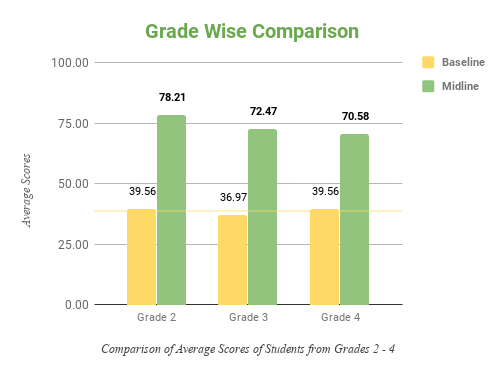 The average improvement of grade 2 was higher comparison to grade 3 and 4. We can see more increment in grade 2 where 39.56 % in baseline whereas 78.21% in midline. As the graph indicates, student performances in all schools have increased significantly except Chandanpur BS. This School has issues like poor management and irregularity of teachers. In addition, one of the teacher was on long leave as she was sick. Nagarchan school has shown significant improvement from 21.21 % to 64.41 % in students learning whereas Chandanpur BS shown decreased in performance of around 6%. Secondly, Netra Jyoti BS and Latinath BS has shown around 47% percent of increment. The digital literacy program in schools has been running smoothly and has generated interest amongst students and teachers. It ensured that each student gets to learn at his or her own pace. That has resulted in students comprehending concepts and ideas better, thus resulting in a lower standard deviation, whilst keeping a high mean. Conclusion: The comparison of baseline and midline survey results revealed that, students have made an impressive improvement in learning English, Science and Mathematics. Though we are aware that many factors contribute to the improvement in student learning, students were able to learn concepts at a pace that would not have been possible with the traditional way of learning. As the graph indicates, student performances in all schools in three classes’ subjects have increased significantly and digital literacy program has shown positive impact on the student performance. We can claim that effective integration of digital materials in the classroom practices will enhance student learning and lead to better results in future.